Very unusual building. Great capture. Thanks for the explanation. Thank you very much. Sorry for the late response. I overseen your comment. Of course, the three open windows make the composition. Great eye. Thank you so much. Most people are not seeing it even on the photo. You have a great eye, too. The Sprinkenhof building was constructed by the architects Hans and Oskar Gerson and Fritz Höger in the years 1927-1943. The type of the building is called "Kontorhaus". 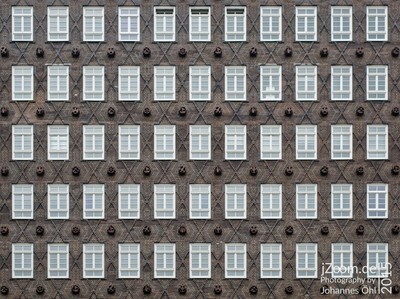 The ornaments between the windows are made by Ludwig Kunstmann. They are showing different symbols for skilled crafts and trades.